As part of epidemiological monitoring of contagious diseases in Slovenia, there were 0 to 3 outbreaks of waterborne diseases per year reported in the period 1997–2008; some 34 to 256 people were taken ill in each outbreak. In most outbreaks, the following causative agents were isolated in stool samples of those affected: calicivirus, rotavirus, E. coli, Shigella sonnei, Cryptosporidium p. and astrovirus. The outbreak of waterborne diseases indicator represents the number of reported infections of the gastrointestinal tract with waterborne pathogenic viruses, bacteria or protozoa related to drinking water. The infection source is microbiological contamination of drinking water via faeces; therefore, the indicator is a sign of drinking water quality. Drinking water can carry various causative agents of infection: bacteria (Salmonella typhi and other Salmonella types, Campylobacter jejuni, Escherichia coli, Vibrio cholere, Yersinia enterocolitica, Shigella spp., Pseudomonas aeruginosa) and viruses (adenovirus types, enterovirus types, hepatitis A and E viruses, norovirus types, rotavirus types) (Cryptosporidium parvum, Giardia intestinalis). Contaminated drinking water used for drinking, cooking, food preparation or other household purposes can cause illness. An outbreak is an occurrence of a contagious disease greater than would otherwise be expected at a particular time and place and in the number of affected individuals (at least two cases). Outbreaks are sudden and affect individuals using drinking water from the same source or area. The disease may affect all age groups; those affected show similar clinical symptoms. Meteorological conditions, and disruptions in drinking water treatment and distribution can have an impact on an outbreak; outbreaks also occur in developed countries. The European Environment and Health Information System (ENHIS), december 2009. Achieve, as early as possible, detection, information and dealing with outbreaks of waterborne diseases and reduce the number of cases of gastroenterocolitis of unknown etiology. It is necessary to improve the microbiological quality of drinking water in Slovenia and, in particular, faecal contamination. All inhabitants are entitled to have access to safe drinking water or, when necessary, suitably treated water. In Slovenia, the number of outbreaks of waterborne diseases has ranged between 0 and 3 per year in the past 12 years (1997–2008), totalling 21 (Figure ZD4-1). 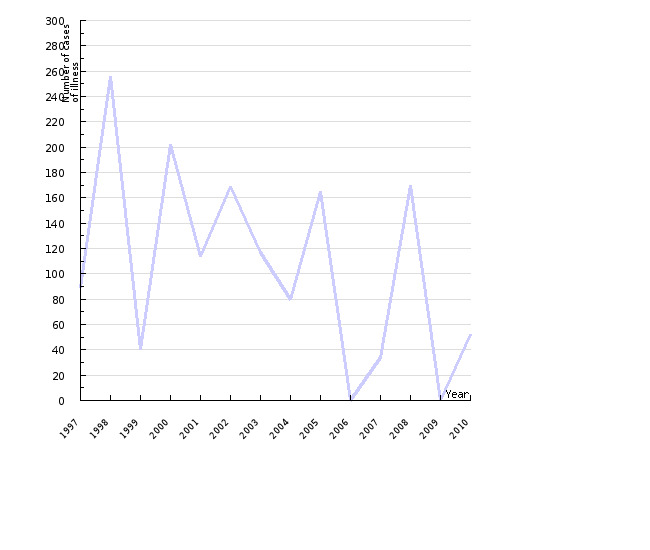 The number of cases reported in each outbreak ranged between 34 and 256, totalling 1309 (Figure ZD4-2). The causative agent was not proven in some outbreaks; in the majority of outbreaks, however, causative agents were isolated from stool samples of patients: calicivirus rotavirus, Escherichia coli, Shigella sonnei, Cryptosporidium parvum and astrovirus. In outbreaks of waterborne diseases, there are often several infectious agents, in particular if drinking water contamination via faeces is involved (Institute of Public Health of the Republic of Slovenia, 1997–2008). The number of reported outbreaks of waterborne diseases is underestimated. A part goes unnoticed since patients do not seek medical help on account of a mild clinical presentation or for other reasons. In 2007, intestinal infections ranked second among contagious diseases (20,942 reported cases, which is 16% more than in 2006). In the last five years, the top ranking on the list (in addition to chicken pox) was taken by gastroenterocolitis types of unknown etiology (23% of all reported contagious diseases) (Institute of Public Health of the Republic of Slovenia, 1997–2008). In these cases, too, infectious agents can be carried in drinking water. A large portion of the population in Slovenia has no access to safe drinking water. In 2007, 9% of the population was supplied from their own water sources not covered by the drinking water monitoring system; moreover, small water supply systems are largely contaminated with faecal microorganisms due to insufficient drinking water treatment (Institute of Public Health of the Republic of Slovenia, 2007). Figure ZD4-3 shows the number of outbreaks of waterborne diseases in certain European countries in the period 2000–2005. The number of outbreaks of waterborne diseases in individual countries was as follows: Croatia 1–3, Finland 1–10, Hungary 1, Slovakia 1–3 and the UK 1–6. The number of sick persons per year was as follows: Croatia 9–73, Finland 136–6,428, Hungary 25–203, Slovakia 13–70 and the UK 4–372. 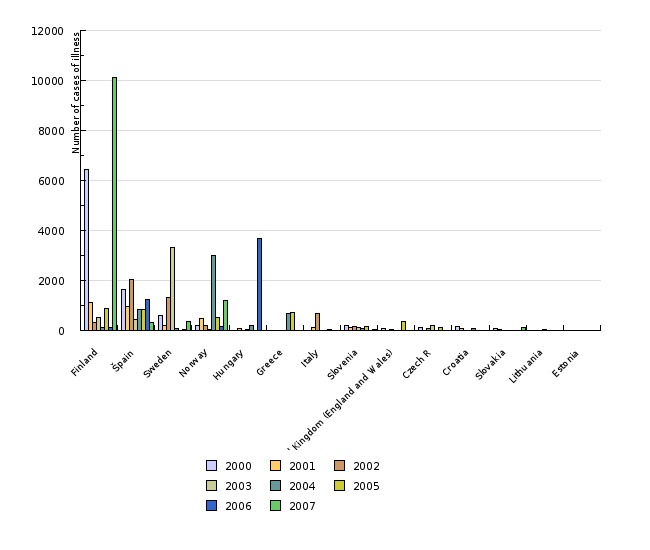 Total number of individuals taken ill due to outbreaks of waterborne diseases in selected European countries in the period 2000-2005 is shown on Figure ZD4-4. Drinking water quality in Slovenia is regulated by the Rules on drinking water (Official Gazette, No. 19/04, 35/04, 26/06, 92/06, 25/09), which have been harmonised with the Drinking Water Directive, Council Directive 98/83/EC. The Rules lay down requirements for ensuring safe drinking water (compliance, health suitability) and stipulate microbiological, chemical and indicator parameters and their limit values. Microbiological contamination – in particular faecal – of drinking water is a potential source of gastrointestinal infections. Small water supply systems serving up to 1,000 inhabitants are the ones most contaminated in Slovenia, especially the smallest systems serving 50 to 500 inhabitants (areas served) (Institute of Public Health of the Republic of Slovenia, 2007). The WHO-UNECE Protocol on Water and Health (WHO-UNECE, 1999) sets targets for the prevention of water-related diseases. It defines access to safe drinking water, requirements regarding drinking water treatment and surveillance, and contingency plans for responding to outbreaks and for their prevention. WHO has also developed a concept of water safety planning. This is a new approach to ensure the safety of drinking water by improving the risk assessment and management of the system for drinking water treatment and distribution (WHO, 2004; Davison, 2005). In 2004, the Children’s Health and Environment Action Plan for Europe (CEHAPE) was adopted at the Fourth Ministerial Conference on Environment and Health, focusing on four regional priority goals (RPGs) in order to reduce the burden of environment-related children’s diseases. One of the regional priority goals is to prevent and significantly reduce morbidity and mortality arising from gastrointestinal disorders and other health effects by ensuring that adequate measures are taken to improve access to safe and affordable water for all children (CEHAPE, 2004). Objectives summarized by: Children's Environment and Health Action Plan for Europe - CEHAPE (June 2004), Operational Program for drinking water supply (July 2006). Source database: The data have been routinely collected on an ongoing basis for over 10 years, i.e. from 1990 in the SURVIVAL computer program. 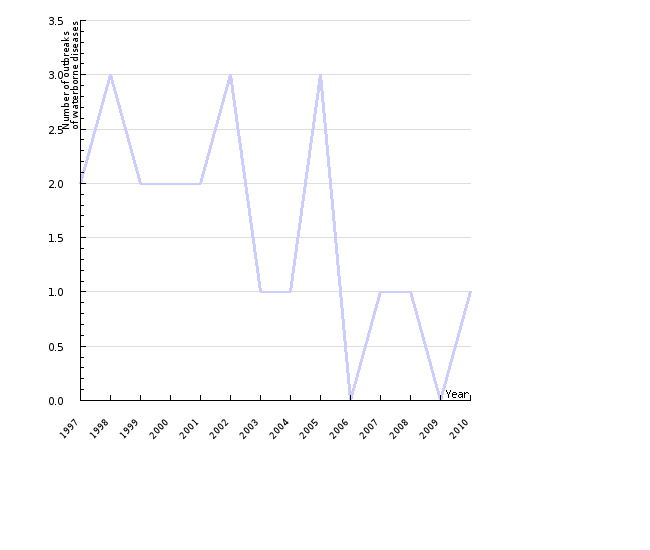 Data for the indicator have been taken from the SURVIVAL computer program and annual reports on outbreaks of waterborne diseases, all at the Institute of Public Health of the Republic of Slovenia, for the period 1997–2008 (Kraigher, A., et al.). 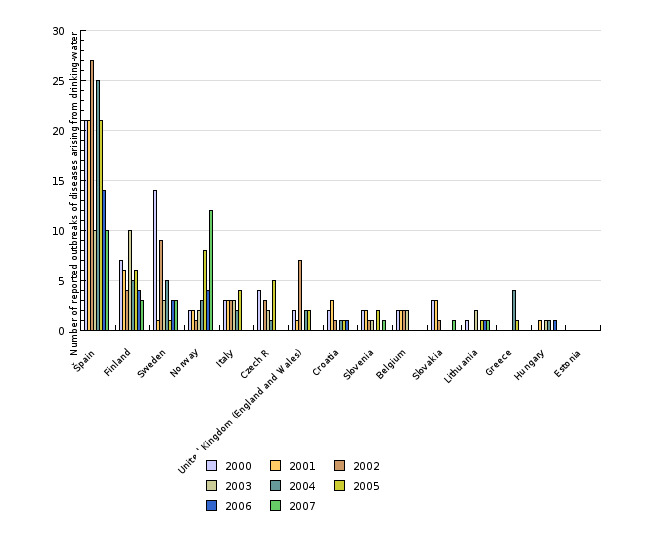 Methodology and frequency of data acquisition: The epidemiological monitoring of contagious diseases in Slovenia is regulated by the Contagious Diseases Act (Official Gazette, No. 33/06), stipulating that contagious diseases included in a specified list must be notified, and by the Rules on Reporting Infectious Diseases and Special Measures for their Prevention and Controlling (Official Gazette, No. 16/99), laying down the notification regime. The obligatory reporting includes, inter alia, diseases that can be transmitted via microbiologically contaminated drinking water (with faeces) (enterocolitis, dysentery, cholera, typhoid fever, viral hepatitis). Article 6 of the Rules specifies the obligation of each physician to notify – within three to six hours after there is a confirmed or high suspicion of an epidemic or epidemics of communicable diseases – the Health Protection Institute and participate in control of the epidemic. The Health Protection Institute immediately notifies the Institute of Public Health of the Republic of Slovenia. The Health Protection Institute lays down measures to control epidemics of contagious diseases and participates in their implementation. Data processing methodology: The Centre for communicable diseases of the Institute of Public Health of the Republic of Slovenia publishes the data in its monthly and annual reports. Information concerning data quality: Reports are published on the website of the Institute of Public Health of the Republic of Slovenia and sent to medical institutions in Slovenia. The reports show the number of reported outbreaks and the number of affected persons, as well as the incidence per 10,000 inhabitants. Notifications cover the whole country through regional health protection institutes. Disadvantages: Does not detect all outbreaks: diagnosis of outbreaks of waterborne diseases is based on faecal contamination indicators, while causative agents of waterborne gastrointestinal infections are harder to detect in water. Data have been acquired largely from national research. Monitoring the incidence of outbreaks of waterborne diseases is included in the overall contagious disease monitoring system in the majority of countries. Methodology and frequency of data collection for the indicator: Data are collected annually and cover the period 2000–2005. Data processing methodology: Data on the number of outbreaks of waterborne diseases and the number of persons affected by the outbreaks for individual years were used. - CEHAPE, 2004. Children’s Environment and Health Action Plan for Europe. Declaration. Fourth Ministerial Conference on Environment and Health, Budapest, 23–25 June 2004 (EUR/04/5046267). - Davison, 2005. Davison A et al. Water safety plans. Managing drinking-water quality from catchment to consumer. Geneva, World Health Organization, 2005. - ENHIS, 2007. Outbreaks of waterborne diseases. Fact sheet No.1.1 – May 2007. Code: RPG1 WatSan E1. World Health Organization, Europe. - IVZ, 2007. K. Bitenc, I.Gale, A. Petrovič. Monitoring pitne vode 2007. Poročilo o pitni vodi v Republiki Sloveniji. Inštitut za varovanje zdravja Republike Slovenije, 2008. - Kraigher A. et al. Epidemiološko spremljanje nalezljivih bolezni v Sloveniji v letu (1997-2007). Letno poročilo. Center za nalezljive bolezni. Ljubljana: Inštitut za varovanje zdravja Republike Slovenije. - WHO-UNECE, 1999. Protocol on Water and Health to the 1992 Convention on the Protection and Use of Transboundary Watercourses and International Lakes. Second Meeting of the Parties to the Protection and Use of Transboundary Watercourses and International Lakes, The Hague, Netherlands, 23–25 March 2000. Copenhagen, WHO Regional Office for Europe and Geneva, United Nations Economic Commission for Europe, 1999. - WHO, 2004. Guidelines for drinking-water quality, 3rd ed., Vol. 1. Recommendations. Geneva: World Health Organization, 2004.